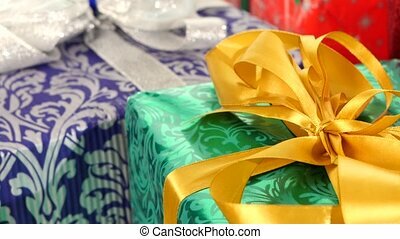 High angle view of Christmas gift box wrapped in craft paper and tied with plain baker's twine on the dark wooden planks with decorating elements Holidays and Gifts concept. 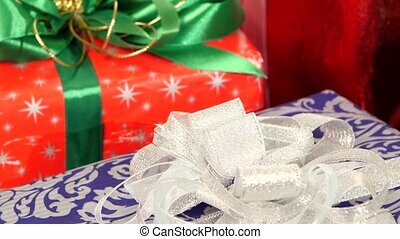 Opening Beautiful Gift Box With Ribbons and Big Bow. 5 videos in 1. 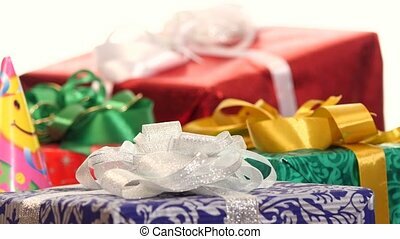 Unpacking Gift 3d Animation Elements on Green Screen Alpha Channel. Untying Decorative Knot. 4k Ultra HD 3840x2160. 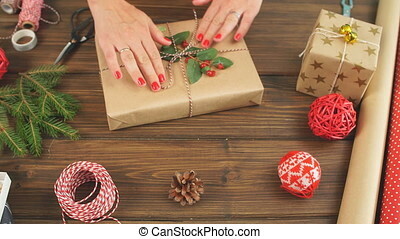 Female hands holding present box wrapped in red paper and tied with backer s twine on the wooden table with decorating elements paper roll, Christmas baubles. 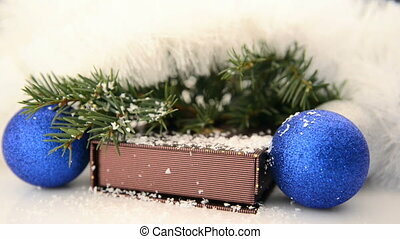 Christmas tree and decorations on a snow. 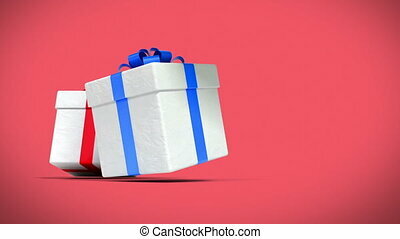 Many Beautiful Gifts and Presents falling on red background 3d animation. HD 1080. 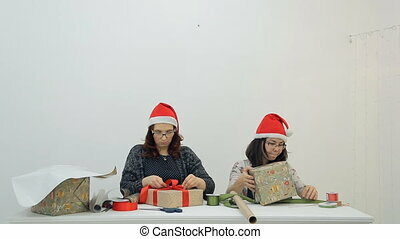 Two young women in glasses and red caps tie bows on gifts and laugh. 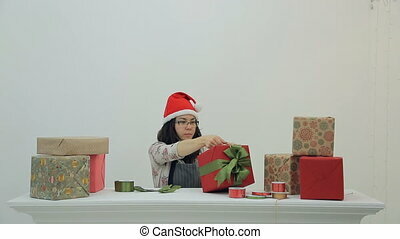 People engaged in the evening packing gifts for Christmas and New Year in a spacious bright room with large windows. They are fun to talk, joke and work. 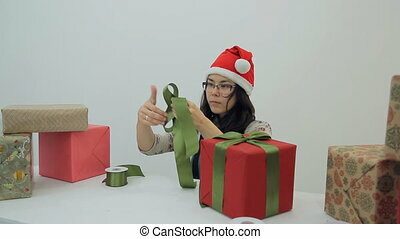 Model of European appearance with curly hair wraps a square box with a scarlet ribbon, brunette Asian appearance is green eyeballs for packaging. Nearby on a white table are finished products. 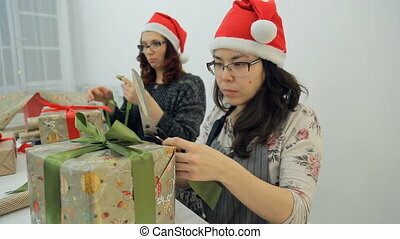 Two women in caps and sunglasses concentrated tie bows on the boxes. 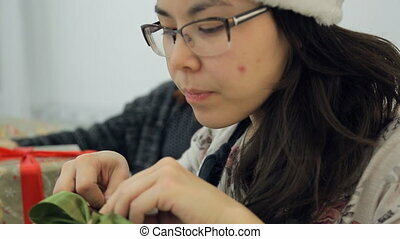 In the foreground a young Asian hands carefully tying a green ribbon on a square case. 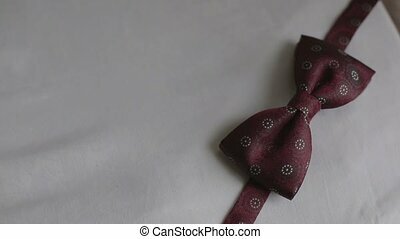 Behind it a model of European appearance with red hair more cut with scissors scarlet eyeballs. 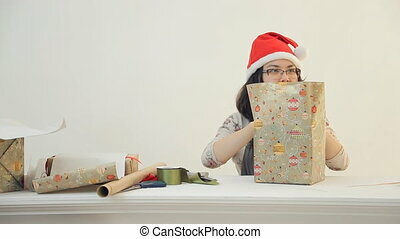 Helpers Santa Claus in a hurry to prepare presents in time for Christmas and New Year. 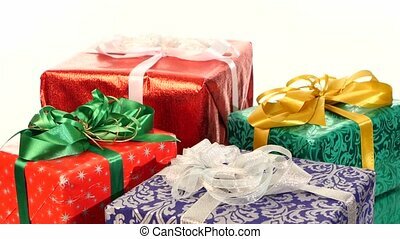 In December of harvesting and decoration of surprises and gifts. 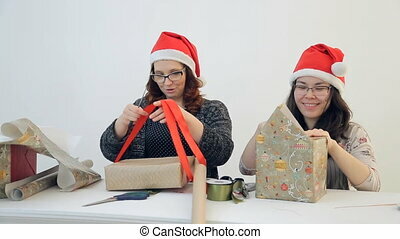 Two charming women pack Christmas gifts. 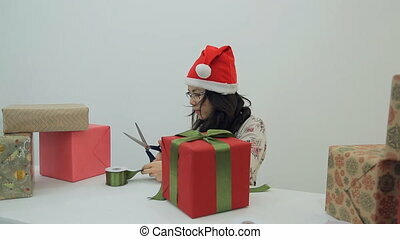 Cute brunette in red New Year cap trimmed with white fur and black square glasses works intently to create festive atmosphere and good mood. 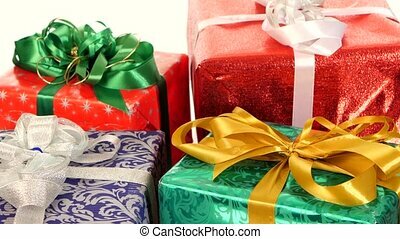 Elf of Santa Claus on the right side smiles all the time with joy and happiness looking forward to upcoming celebration and preparation process. Other on the left side is very serious. 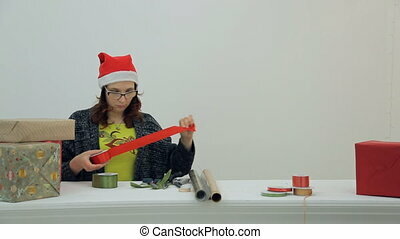 She cuts ribbon, grumbling at all fuss and futility of this work. 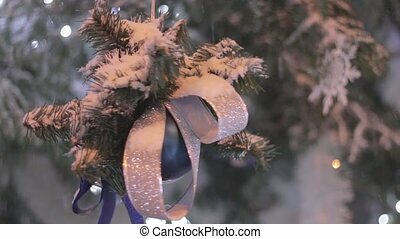 Two women decorate artificial fir tree covered with frost. 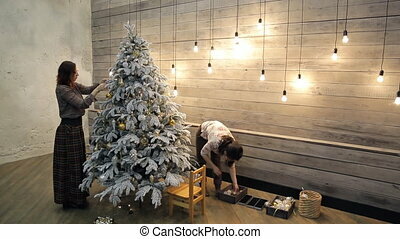 Christmas tree decorated with a lot of gold, silver, snow balls, pine cones stand in loft room. 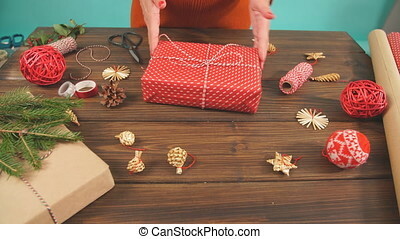 Caucasian redheaded woman with flowing hair, in grey jersey with brown pattern, long cell skirt hang toy on left side, on right Asian with dark hair in white sweater with pink roses, coffee jeans look for place for one more decoration. 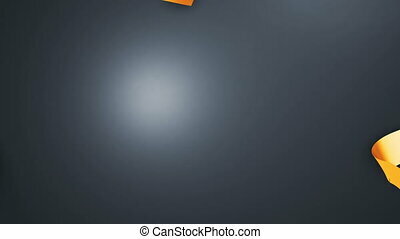 Near there is small wooden chair. On wall - glowing light bulbs of different lengths.